All workplaces need efficient members of staff who can communicate well and excel at customer service. Our business and administration qualifications have been designed to deliver the most relevant and up-to-date skills to help learners match the needs of employers. This nationally recognised qualification is designed to help pupils bridge the gap from KS4 to sixth form - another way to cope with RPA policy. To achieve the Level 3 Certificate in Principles of Business and Administration, learners must complete all five units. 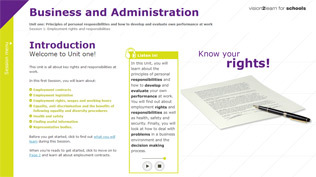 This unit is about understanding one's own responsibilities for action in a business environment, including legislative and contractual responsibilities and ways of managing and evaluating work effectively. This unit is about the knowledge and understanding needed to work effectively with others in a business environment, including communication, working in and supervising a team, and providing customer service. This unit is about knowing and understanding how to manage information and design and produce documents securely when working in a business environment. This unit is about providing and maintaining specific administrative services, including ordering goods and services, minimising waste and delivering effective customer service. This unit is about understanding how to make contributions to improving ways of working and the reasons for change occurring in a business environment.